DATAVERSITY Education, LLC releases a Call for Presentations for the 2017 Smart Data Conference to be held at the Sofitel San Francisco Bay Hotel in Redwood City, California on January 30-February 1, 2017. 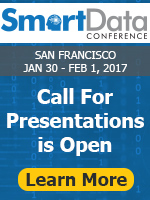 Interested industry experts and professionals can review the guidelines, topics, and submission process by visiting http://smartdataweek.com/cfp.cfm. All submissions must be made by August 29, 2016 to be considered. DATAVERSITY welcomes a range of Smart Data and Machine Intelligence technology presentations on everything from Cognitive Computing, Machine Learning, Artificial Intelligence, Semantic Technologies, Deep Learning, Internet of Things, Graph Databases, and more. To see the complete lists of topics, please visit http://smartdataweek.com. Opportunities exist for 45-minute conference sessions, 90-minute tutorials and workshops, 5-minute lightning talks, as well as 45-minute panel discussions. We encourage speakers to provide case studies, business-focused examples, and practical experience. The three-step submission process, guidelines, submission instructions, and a list of relevant topics can be found at http://smartdataweek.com/cfp.cfm. For press inquiries or to request a press pass, please contact Laura Lucht at laura(at)dataversity(dot)net or 310-337-2616 ext. 8. For event sponsorship inquiries, please contact Warwick Davies at warwick(at)dataversity(dot)net or 781-354-0119. The Smart Data Conference is an educational conference and exhibit focused on innovative data technologies in Machine Intelligence, Cognitive Computing, Machine Learning, Semantics, Deep Learning, Internet of Things, and more. It is designed to accommodate all levels of technical understanding, from novice through expert, and will bring together emerging disciplines that are focused on intelligent information analysis and automation. Additional details are available at http://smartdataweek.com. DATAVERSITY.net is an educational and publishing resource for business and information technology (IT) professionals on the uses and management of data. Our worldwide community of practitioners, advisers, and customers participate in, and benefit from hosted conferences, articles and blogs, as well as live webinars, daily news reports, and more. Active members enjoy access to presentations, research, and training materials. For more information about DATAVERSITY, visit http://dataversity.net. Smart Data Call for PresentationsSubmit your presentation proposal for Smart Data 2017.